Below are two viewpoints published in the TODAY paper today. The wife and I applaud the assumptions put forth by Mr Wong to debunk the common notion that most buyers of shoeboxes are investors. We wonder if the relevant authorities/experts (URA, CBRE Research etc) will care to respond. 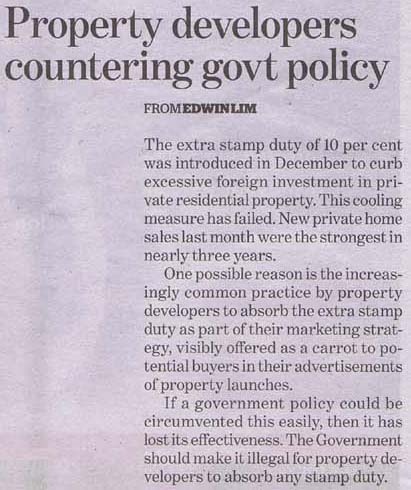 Even if the government does outlaw direct absorption of extra stamp duty, there are many other ways/methods that property developers can "offset" such duty. And a rose by any other name is still a rose.... and smell just as sweet. 1 comment to ''TODAY's opinion piece: Your opinion?" They could be retirees as well. Funny thing is that kbw is building a lot of Hdb studio apartment for elderly couple as he foresee a need in the future. So why does he not think that retirees might be able to afford mm house to stay in.